Kimberly experienced excess weight gain and major acne during her junior year of college. She tried all kinds of diets, but nothing worked. It was during her global backpacking journey across 50 countries that she discovered beauty secrets from around the world. She returned home to become a clinical nutritionist. Her clients include Drew Barrymore, Hilary Duff, Josh Duhamel, Fergie, Minka Kelly, Kate Mara, Teresa Palmer, Mark Ruffalo, Abigail Spencer, Ben Stiller, and Kerry Washington. Kimberly’s signature smoothie is the Glowing Green Smoothie. I drink it every morning for breakfast. 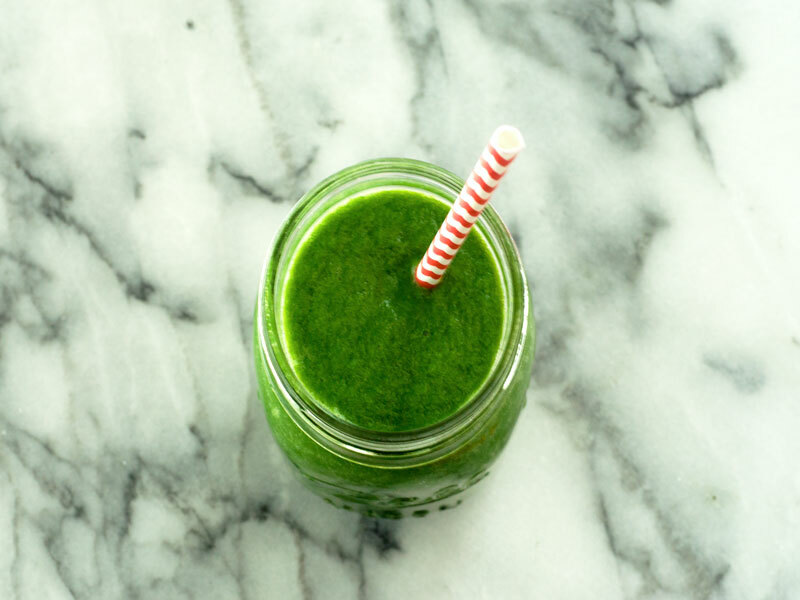 The Glowing Green Smoothie is one of the best changes I made to my diet. It allows me to consume over 3 cups of dark leafy green vegetables. I make a batch in my Vitamix blender. It takes about 15 minutes to prepare. You can mix and match your greens and fruit. Vary the recipe with kale, chard, arugula, or similar greens. The fresh fruit balances the taste of the greens and adds powerful antioxidants and vitamins. Unlike juicing, blending allows you to retain all of the fiber. Blending also keeps the foods from oxidizing as quickly. Since the vegetables and fruits are chopped and blended, your body doesn’t have to do the breaking down to get the nutrients. The fiber in it also helps you to feel full, so you don’t overeat. The smoothie will last for 2-3 days in the refrigerator. You can also make it once a week and freeze in portion-size glass containers. I take my smoothies with me on my trips. I just keep them cold in my food bag. Kimberley Snyder recommends starting out consuming around 16 ounces of the Glowing Green Smoothie and working up to 24 ounces or more. Drink it slowly so it mixes well with your saliva to aid the digestion process. Wait 30 minutes before digesting any more food. It costs about $4 per serving. I mainly use organic produce. Refer to the Dirty Dozen Clean 15 Guide. I recommend investing in a Vitamix for the best tasting smoothie. I use the Vitamix 5200. Cleanup is also easy with the Vitamix. Fill the blender container halfway with hot water and a drop of detergent. Blend on high for 1 minute. Rinse with warm water. And I’d love to know, what are some of your healthy habits?